Gloves: Use only polyethylene gloves. Other gloves may contain silicones that can contaminate the surface. Clean: Use only clean utensils (tweezers, etc) when handling samples. Make sure theses have been cleaned to remove hydrocarbon and silicone contaminants and dedicate their use to ESCA samples only. Keep your samples in a “clean” environment. A laminar flow hood or a clean laboratory environment is strongly suggested. Hydrocarbon: Pump oil, greasy finger prints, dirty dessicators, dirty solvents. Silicones: Non-approved gloves, glass-fitting-grease, dirty dessicators, hair, hand lotion. Salts: Sodium, chlorine, potassium, can be introduced through improper rinsing or exposure to water that has not been properly purified. Controls: Always include control samples with the sample of interest. A control could include a sample of just the underlying substrate and/or a sample of the underlying substrate exposed to solvent used for the surface modification without the actual modifying agent. Duplicates: It is best, if possible, to send duplicate samples, even if only one is to be analyzed. Sometimes samples are damaged in transport or, on a very rare occasion, can be damaged while loading for analysis. Samples Summary: Include a sheet with a list of the specific samples that are included and what is on them. Structure: Proper ESCA analysis requires the structure of the surface bound species and knowledge of the underlying substrate. Without this information accurate analysis of the ESCA data is difficult. Figure 1: ESCA sample holder (side and top views) showing the mounting of 1cm x 1cm conductive samples. The sample holder is ~5cm in diameter and can hold samples slightly larger than the holder size. Packaging: We suggest shipping samples in tissue culture polystyrene (TCPS) dishes sealed with parafilm. To prevent the samples from rattling around during transport, we use a small amount of double sided tape to secure the back of the samples to the bottom of the TCPS dish. It is very important to only stick a small corner of the sample to the tape. If the center of the samples is stuck to the tape or there is tape under the entire sample it is nearly impossible to remove the samples without damaging them. Please try sticking down a “test” sample and be sure it can easily be removed before packaging other samples. We have shipped many samples without incident and have discovered that only taping a small part of the corner is required to secure the sample (see Figure 2). Know Your Contact: Be sure that you are shipping your samples to the correct address and contact person. Our shipping address is NOT the same as the usual mailing address. The shipping address will be given out once samples have been approved for analysis. Also, inform your contact that the samples are being shipped to ensure that they will look out for your samples, and inform you if they do not arrive. If you have questions, please contact us. Sample Size: Our ESCA systems can accommodate a wide variety of sizes and shapes in samples. We have also been known to “cut” samples down to size if necessary. Please inform your NESAC/BIO contact of the shape and size of the sample and we will suggest options. Outgassing: One of the main limitations for ESCA samples is their outgassing properties. ESCA is a technique which MUST be preformed in a vacuum chamber with pressures of ~5x10-9 Torr. (See ESCA Techniques). Samples such as polymerized tetraglyme, “wet” silicones, or any “spongy” type sample which soaks up water will have some trouble pumping down to the appropriate pressure. 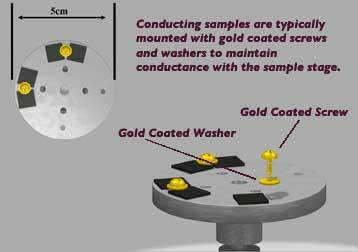 However, there are methods we can use to analyze these samples, such as reducing the size of the sample. If your sample may present a problem, please notify your contact person and arrangements will be made for special analysis. Figure 2: Only a small piece of tape at the sample corner should be sufficient to fix your samples in place for shipping.